After a busy weekend visiting friends and their lovely little daughter in Birmingham, there was not a lot of time for thinking about what I am going to cook this week. But this afternoon I was able to sit down and browse my latest Delicious Magazine and my Tempting Treats cookbook and see what tickled my tastebuds for the week ahead, half of which will be solo cooking for 1 and so all the more challenging. 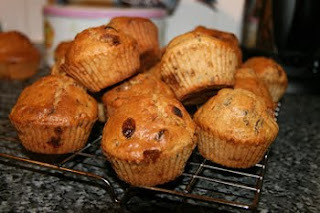 After perusing my options and then braving the shops, I decided to make Rum and Raisin muffins tonight. I love Rum and Raisin, in ice-cream normally, but never having tried it in muffins I though that was a culinary experiment worth trying. So they are in the oven and I can’t wait to sample one as soon as they come out. Dinner took a bit of a back seat tonight as I’m working on a valentine’s day gift for a friend and I’m on a tight deadline and the muffins were 2nd priority so dinner was a slightly sad 3rd. 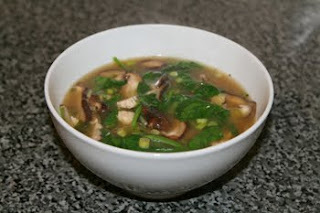 I had some shitake mushrooms in the fridge which needed using and as I had more than my fair share of fattening food this weekend, a light, healthy miso soup was the order of the day. Nothing could be simpler, veg stock a cinnamon stick and ginger, along with some miso powder, spring onions, spinach and chicken and of course, the mushrooms. No oil or fat to be seen which gives my poor stomach a rest from the abuse of red wine and far too much chocolate which I have indulged in this weekend. (I’m not counting the muffins as I haven’t had one yet!) 20 minutes and dinner is served. On a totally off-the-topic note, I had a thought today. We I had a quite a few actually, it would be hard to function as a person in the world without thoughts, but I had a big, profound thought. I think it stemmed from The Princess and the Frog – which was the movie that we took Vashanna (3 years old) to yesterday. It is not a movie that I would normally watch, I have nothing against animations but it was not 3d, it was not pixar-level amazing graphics. It was just a modest little animated movie with a cute ‘underdog girl goes through trials and tribulations and gets to marry a handsome prince’ storyline. But it made me remember something and I have been thinking about it ever since. It made me remember that I don’t have to make a lot of money, I don’t have to have a big, important job. Those are not the things in life that we look back on when we are in the twilight of our lives. The things we look back on are the life things. The laughter and the friends and the love and the family. Something happened a few months ago that set me on the wrong road, thinking that the end of my path was doom and misery unless I make a ‘success’ of myself and made more money. But that is not what is important, and I will not let myself be made to feel like that any more. I am not a rich-and-important person, I am a getting-by-and-surviving person. I am not a happiness-and-light person, I am dark-and-cloudy, but I try to be a good person every day. I try to love with all I have without letting my fear of the future overcome me, and I try to make people smile, without being sad that I don’t have a best friend to call at night and talk to about the funny things that happened in my day and how my muffins always rise skew. Skew like they are being blown by a strong wind while they are trying to rise. They want to rise straight-up but the oven just won’t let them. So now I am going to sample one of my skew muffins and smile and finish my design and go to sleep happy. So until tomorrow, happy cooking.